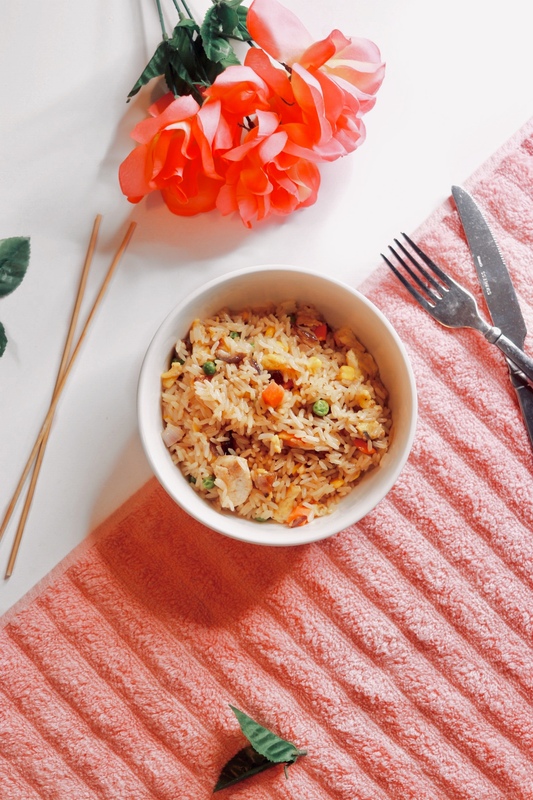 Chicken Fried Rice is one meal I’ve been obsessed with lately. Each time I stop at the grocery store, I can’t help but pick up ingredients for it, even when I’m super broke and trying to stick to a budget. It is one meal I love to prepare to get my evening started because it is super quick and easy to make. 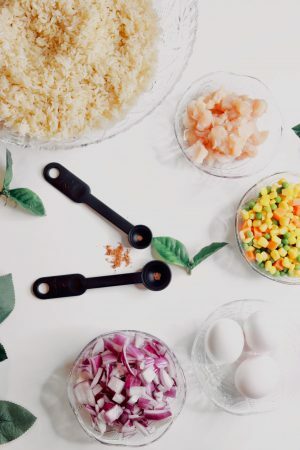 The great thing about making Chicken Fried Rice is just how affordable the ingredients are. I spend roughly between $10-$12 getting all the ingredients together, so I usually end up saving a ton of money. Lately, I’ve been pretty occupied with so much school work that I rarely have time to meal prep. So I find myself making this bad boy quite often since it isn’t time-consuming. 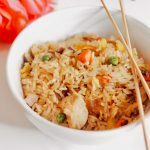 With that being said, if you are looking for a Chicken Fried Rice recipe that won’t take you forever to prepare, and would also save you a ton of money, well….. you came to the right place. I will be sharing my recipe with you, which is so affordable and less time-consuming. For this recipe, I like to keep things very simple, because less is SO MUCH MORE!! In that case, I don’t buy whole vegetables, as I find them to be so time-consuming to chop. So I stick to the regular frozen chopped mixed veggies found at most grocery stores to save myself the stress. I also keep the number of spices I use on a low because Chicken fried rice is one of those meals you shouldn’t use too many spices in since the soy sauce already adds enough flavor. So sticking to regular salt and pepper works just fine. Unlike most cooks who prepare their ingredients separately and eventually combine it together in the end, I personally find that process to be a bit tedious. Instead, I mix all my ingredient from scratch because I notice it makes the flavor stay very rich. 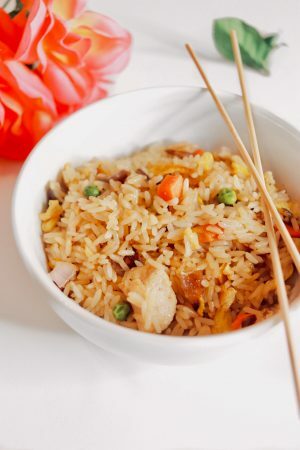 My secret to an amazing Chicken Fried Rice is really in the sauce. 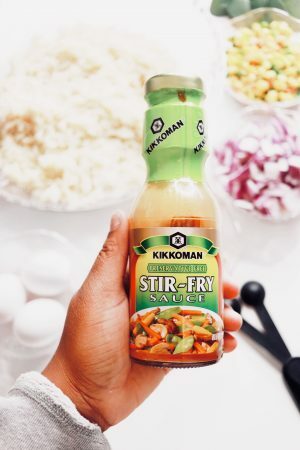 To get the best-tasting rice, I use the Kikkoman Stir-Fry sauce with a little bit of extra low sodium soy sauce to add more flavor to the rice. It makes it taste SO GOOD! Let me know in the comments what your favorite rice recipe is! Join over 12,000 monthly visitors and receive updates on the latest lifestyle posts, food recipes, as well as some secret giveaways for my loyal family. You sure don't want to miss this! Wash rice thoroughly to remove starch and set aside. To a medium sized pot, boil about 3 cups of water on medium heat. Add in washed rice to boiling water with about a tablespoon of salt. Cook for 10 mins or until fully done. Once cooked, set rice aside in a refrigerator to cool down. Chop onions and chicken breast into bite-sized pieces and set aside. Beat 3 large eggs and set aside. To a large frying pan, heat some canola oil and throw in the chopped red onions. Allow the onions to fry until the redness starts to slowly fade off. Coat your chopped chicken breast with salt and pepper and add to the frying pan. Cook the chicken until brown. Add in your beaten eggs to the pan and scramble it in the mixture. Thrown in your chopped mixed vegetables and cover the pan for about 5 mins. This will allow the steam to soften up the vegetables. Open up the pan and combine thoroughly. Once combined, add in your cooled precooked rice to the mixture with about 3 oz of Kikkoman stir-fry sauce combined with 3 tablespoons of low sodium soy sauce. 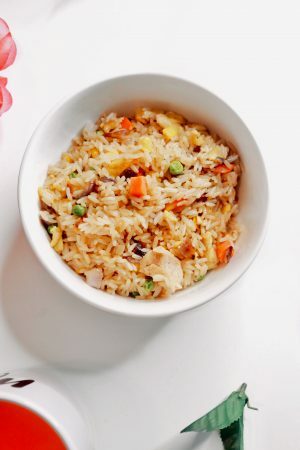 Mix ingredients thoroughly for about 5 mins or until the rice is fully fried and incorporated in the mixture. Cover pan and allow to cook for an additional 2 mins.